So I have actually managed to find some time to read blogs this month so this post may be a little longer than usual however I didn't think you guys would mind so without further ado lets get on with it. I wish there was a post like this when I first started my instagram, and even though I would say I'm okay at flatlaying I definitely picked up some tricks I am going to give a go. I love anything lip related as you probably all know so this post was right up my street. I love reading these quick summary reviews and they are written so well with just enough information. I am horrible when it comes to any sort of analytics, it goes straight over my head so I loved this post as it told me all of the basic things I need to know. Since initially reading I have gone back to this post a couple more times and I really think it is beginning to get a little easier. I feel like a baking post always seems to slip into these roundup posts but I mean if you have a look at this recipe they look absolutely insane I am always going to shout about any recipe that involves three chocolates. I really like the idea for this post and I'm actually currently working on putting together my own A-Z but am struggling with Q,X and Y. Answers on a postcard (or in the comments) please. The photography in this is absolutely flawless and it has made me want to try one of the Sephora lip stains even more than I did before. If you follow me on instagram you will know I have just started bullet journaling so I am currently reading a lot of posts about it. I love how simple this one is set out and I am definitely thinking of making mine a little more straight forward after seeing this. This post was just so true and I love to see Bloggers being unapologetically like screw beauty standards. I also think the various level of editing on the photos added beautifully to the point. All I wanted to do while reading through this was scream hell yes girl you are killing it. It is so nice for a change to see people talking positively about there body image and it just makes me so happy. Considering I'm off to do Forensic biology at uni next year I can relate to this on so many levels. So many people I meet can't get over the fact that I wear coloured makeup and funky liner and be into science and I think TV is the reason why. We science people can be fun too. I love a good click bait title and I loved the reasoning behind this post. So many people seem to think bloggers get things handed to them on a plate however we work hard and I love the fact we now feel confident enough to tell everyone we do. I love a good liquid lip that requires a bit of maintenance but then I do also love a throw on and go lip. There are some beautiful formulas picked out here and as usual I love the photography. Although I haven't had a lot of negative feedback in my time blogging I've had a little bit and it is incredibly hard to push past it and love these three little steps and I think they are something that should be handed out to anyone who starts a blog. If you know me in real life you would know that I love a good organisation session, but something I've never been happy with is the way I organise my blog content. I am actually going to give the google calendar a go and I will update you all if I end up loving it. Instagram is hard work at the moment and I think this would be a fab post for any newbies to the platform to read as it is difficult to know which hashtags to use and it is awfully tempting to use ones such as like for like and follow for follow. 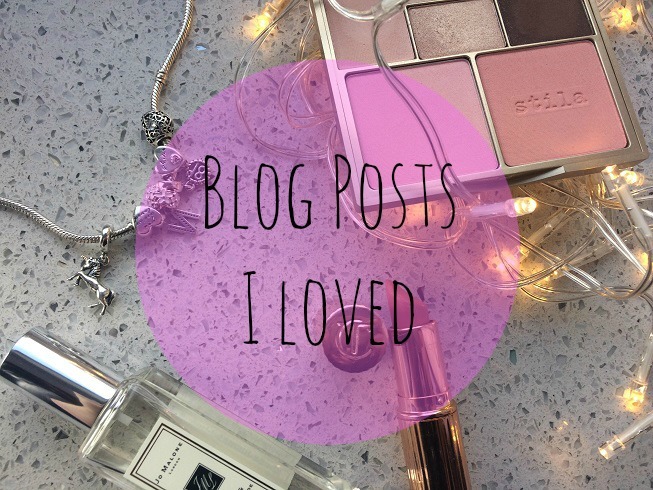 Finally for todays massive post is a post from Clare about a short programme she watched about blogging. I 100% agree with all her opinions here and once again believe it's about time people realised that blogging and youtubing isn't as easy as it may seem. So that's it for today I hope you enjoy all these fab posts! Thank you so much for including me in your round up! I'm glad you liked the post! Thank you for featuring me Cole, so kind of you and glad you liked my blog post! Going to check out the other posts although I spot a few faves in there already!